Community relations is one of the activities that must be owned by every company. As conducted by PT. Angkasa Pura II who do community relations activities on their community. But PT. Angkasa Pura II gets protests from residents. 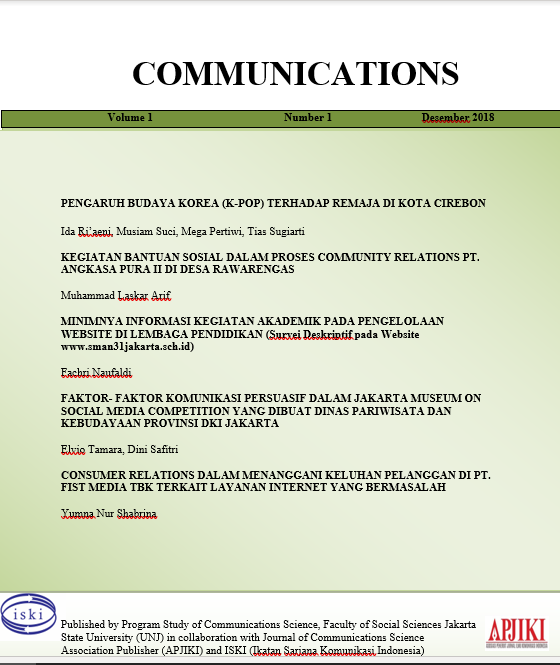 The author has a problem formulation, “How is the process of Community Relations of PT Angkasa Pura II in Rawarengas Village related to Social Assistance Activity conducted by PT Angkasa Pura II Related to Rawarengas Village Protest?”. This study aims to determine the process of community relations PT. Angkasa Pura II in Rawarengas Village related Social assistance activities conducted by PT. Angkasa Pura II related to the protests of Rawarengas Village Residents. The theories used in this research are public relations and community relations management with the five-dimensional variables of community relations process that are targeting, identifying communities, guiding effective community relations programs, communicating with communities and communication channels. This research approach is quantitative descriptive method. The research was conducted in Rawarengas Village. The writer used questionnaire, with interval scale. The population of 94 heads of households and a sample of 94 heads of households using sampling techniques is a probability sampling technique with the technique used is the census and the central tendency is the mean. The results of research that the authors do there are some problems in the process of community relations PT. Angkasa Pura II. This is evidenced by the lowest mean dimension of setting goals, people feel PT. Angkasa Pura II did not give explanation about the problem of runway 3 expansion project directly and people hard to get social assistance so that many citizens who feel less attention. The conclusion of this research is the highest dimension that is the guidance for community relations program because people feel the community relations program done by PT. Angkasa Pura II is in accordance with the instructions and quite good. The lowest dimension is to set goals because people feel PT. Angkasa Pura II did not give explanation about the problem of runway 3 expansion project directly and people hard to get social assistance so that many citizens who feel less attention. PT. Angkasa Pura II should consider the condition of the citizens by visiting the settlement to provide direct socialization of activities to be conducted on the community and provide a direct explanation of the problem of Soekarno-Hatta Airport runway project 3, as well as providing social assistance in the form of sponsorship proposed by the residents before There is a problem happening. Danim, Sudarwan., 2002, Menjadi Peneliti Kualitatif, Bandung: Pustaka Setia. Sangadji, Etta Mamang, 2010, Metodelogi Penelitian, Pendekatan Praktis dalam Penelitian.